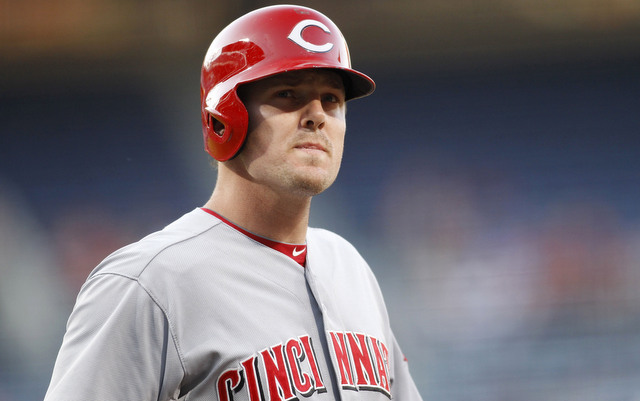 Cincinnati Reds first baseman Jay Bruce was placed on the 15 day disabled list and will require knee surgery that will sideline the 27 year old for 3-4 weeks. Bruce has hit .218/.355/.366 (99 OPS+) with only three home runs in 29 games this season. Bruce was not in the Reds starting lineup on Sunday due to soreness in the knee but apparently there was no indication surgery would be required. Bruce did pinch-hit Sunday and struck out. As it turns out Bruce was prophetic in his evaluation. The loss of Bruce is a blow to a Cincinnati offense that’s tied for 10th in the National League with 116 runs scored. Bruce is one of three players along with Adrian Beltre and Miguel Cabrera, with at least 30 home runs in each of the last three seasons. Bruce, a two-time All-Star, averaged 32 homers and 101 RBIs per season from 2011-2013.